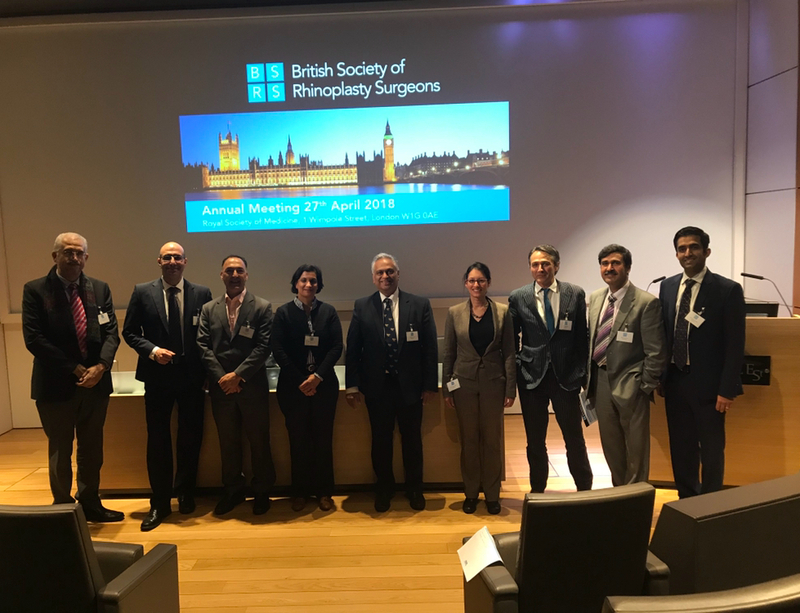 Mr Anari delivered a lecture on Nasal Tip Sutures in rhinoplasty at the annual meeting of the British Society of Rhinoplasty Surgeons in London in April 2018. The meeting was held at the Royal Society of Medicine. Mr Anari delivered a lecture on External Nasal Valve surgery at the European Rhinologic Society Annual Meeting in London in April 2018. This was a very successful meeting and approximately 1800 delegates from different countries attended this congress. Mr Anari presented cases on cosmetic and functional applications of spreader grafts in rhinoplasty. Mr Anari delivered two lectures on this course which was aimed at designing and executing flaps to reconstruct the facial defects. The course was run at the Education centre at Doncaster Royal Infirmary on 18/11/2017. Mr Anari delivered two lectures on this course run on 5th-7th July 2017. Mr Anari delivered a speech on Ageing nose rhinoplasty at the Annual British Rhinological Society meeting in Jersey, UK on 19th May 2017. Mr Anari teaches on rhinoplasty and facial plastic surgery topics on this three-day course (5-7th December 2016). Mr Anari teaches on rhinoplasty and facial plastic surgery topics on this three-day course (15-17th June 2016). This one-day course follows the two-day rhinoplasty course. Mr Anari lectures on ethnic nose and alar base surgery. The afternoon session is allocated to cadaveric dissection. A two-day course on basic and advanced techniques in rhinoplasty with ample opportunity for cadaveric dissection. The course is followed by a one-day facial plastic surgery course. This one-day course followed the two-day rhinoplasty course. Mr Anari lectured on ethnic nose, alar base surgery and nasal reconstruction. The afternoon session was allocated to cadaveric dissection. A two-day course on basic and advanced techniques in rhinoplasty with ample opportunity for cadaveric dissection. The course was followed by a one-day facial plastic surgery course. Due to European Rhinoplasty Summit in Munich 24 -28 March 2014, next Munich Facial Plastic Course will be held in 2015. Mr Anari talked about the cosmetic applications of Botox at the winter meeting of the ENT specialist in Midlands. The meeting was held at Russells Hall Hospital on Friday 10th January 2014. This two-day course offers lectures and hands-on experience on a range of basic and advanced rhinoplasty techniques. This five-day course offers lectures, fresh cadaveric dissection and live operating experience on all aspects of facial plastic surgery. Two day course on basic and advanced septorhinoplasty techniques. Please click on the link below to see the course information. A five-day course on all aspects of facial plastic surgery. Please click on the link below to see the programme. Mr Anari talked about cosmetic applications of botulinum toxin in this one-day national course in Birmingham.